Black Knight 2 Slots | FREE Spins & Expanding Wilds! Join the brave knight and spin to win Black Knight 2 slots! Play the Free Spins Bonus with up to 3 Locked Wild Reels for massive winning chances! 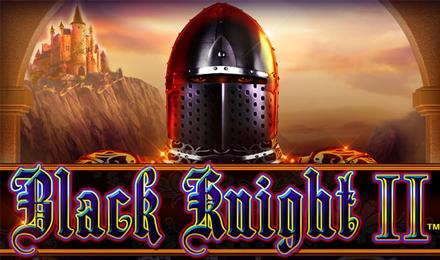 Go on a medieval adventure and play Black Knight 2 slots – the sequel to the super-popular Black Knight slots! There are 5 reels, 4 rows, and 40 paylines filled with brightly colored symbols such as Knights, Princesses, Crowns, and Jesters! The Black Knight himself is the Wild symbol and can expand to make the entire reel Wild! Try to get 3 or more Shield Scatters to activate the Free Spins Bonus for 7 Free Spins and Big wins! Plus, the Wild reels during the Free Spins Bonus will lock in place for mega winning opportunities! Get up to 3 locked Wild Reels for loads of cash prizes today!